City consultants say traffic on the streets, converted to two-way operations, could slow to 4 miles an hour. “If I wanted to kill this idea, that’s the way I would do it,” said one resident of the disclosure. Above: A comment by a resident upon hearing that traffic could slow considerably with two-way street operations. Transportation planners jarred a gathering of Charles Village residents with a “doomsday scenario” that could unfold if St. Paul and Calvert streets are converted to two-way traffic from Fayette Street to University Parkway. A four-mile trip that currently takes drivers an average of 12 to 20 minutes, they said, could wind up taking “upwards of 60 minutes” if the streets, now one way, are converted to carry traffic in two directions. That’s four miles an hour – slower than many people walk. The planners said Tuesday night that traffic wouldn’t always be that slow. But they said it would be possible on both St. Paul and Calvert streets during peak travel times in the morning and evening rush hours. “That’s the worst case scenario,” said Paul Silberman, of Sabra, Wang & Associates, the Columbia, Md., planners hired by the city to conduct the $140,000 study. One man asked how the planners arrived at the 60 minute figure and the 12 to 20 minute figures. Silberman said they got the lower figure by driving on the streets and arrived at the “upwards of 60 minutes” figure by computer projections. The disclosure about the slower travel times changed the tone of the meeting. An audience of about 50 shifted from general open-mindedness about the two-way idea to skepticism and sometimes outright hostility. “STUPID IDEA! WASTE OF MONEY! FORGET ABOUT IT! INCREASE TRAVEL TIME [from] 16 MINUTES TO 60 MINUTES? 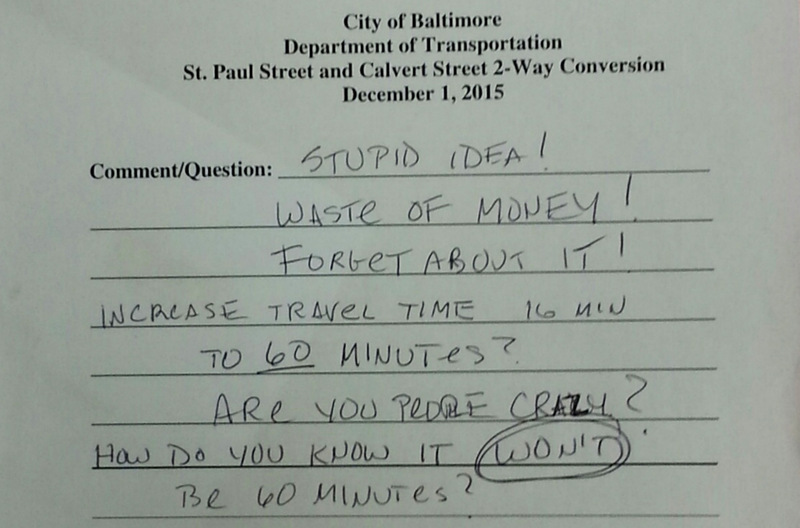 ARE YOU PEOPLE CRAZY?” one woman wrote on her comment sheet that she dropped off at the sign-in desk. “If I wanted to kill this idea, that’s the way I would do it,” said Dennis Richter, a businessman based in Mount Vernon. When the negative comments about two-way travel times wouldn’t stop, a member of the citizen steering committee that’s behind the study, Charlie Duff of Jubilee Baltimore, rose from the audience to ask for calm. Duff said there are methods to prevent two-way traffic from approaching gridlock, such as posting signs to prevent left turns at intersections during rush hour. “We want DOT and its consultants to take a full, deep look at this, and we don’t think they have done that yet,” he said. Duff’s sentiments about reducing travel times were echoed by Valorie LaCour, chief of transportation planning for the city’s Department of Transportation. 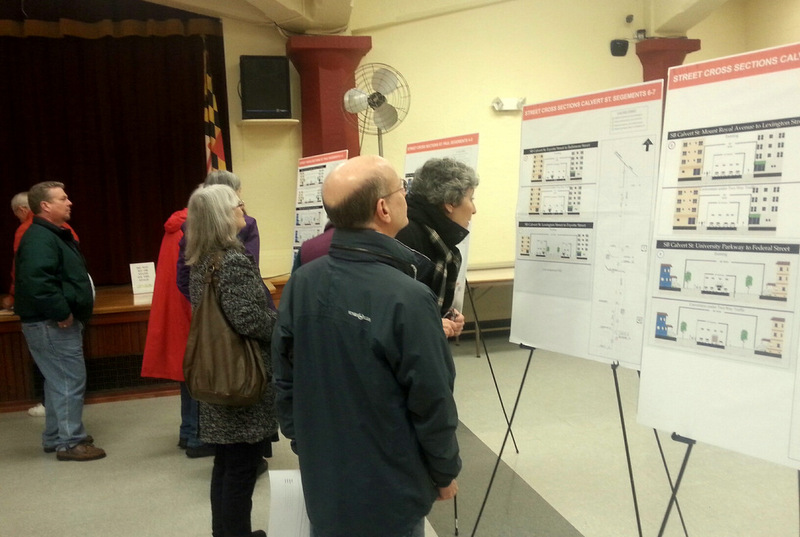 The meeting, at Saints Philip and James Catholic Church, was the first of three scheduled by the transportation department to present facts and get community reaction to the two-way study. The city hired Sabra Wang in 2014 to study the idea of converting the streets to two way traffic along a 40-block stretch from Fayette Street to University Parkway and recommend whether it should happen. They also asked the consultants to explore other traffic calming approaches if the streets remained one-way. Their recommendations could affect traffic patterns in a variety of neighborhoods, including downtown, Mount Vernon-Belvedere, Station North, Old Goucher and Charles Village. The planners said last night that they do not have a recommendation yet, and a final report will be sent to DOT Director William Johnson and other city officials early next year. 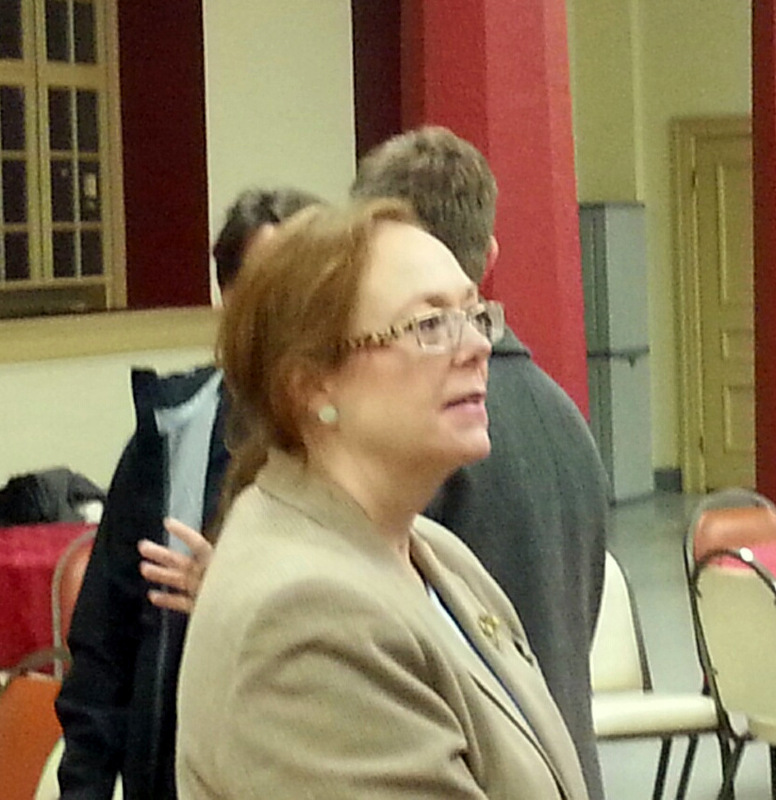 “We have not made a decision, nor have we made a recommendation,” LaCour said. “We want to make sure that all of your comments are taken into account” before a decision is made. The planners spent much of the two-hour meeting presenting findings from their study and answering questions about their methodology. They said a survey of 4,240 license plates indicated that 53% of the drivers who use the two streets live in Baltimore City and 47% live outside the city. Of the non-city residents, 27% came from Baltimore County, 5% from Anne Arundel County, 3% from Howard County, 9% from other Maryland counties and 3% from Pennsylvania. The city residents primarily come from the 21212, 21218 and 21202 zip codes in North Baltimore. The highest volume of traffic on St. Paul Street is during the morning rush hour, and the highest volume of traffic on Calvert Street is in the evening rush. The current morning peak travel time along southbound St. Paul Street is 17 to 20 minutes, according to the study, while traveling up Calvert Street takes 14 to 17 minutes. The evening peak travel time is 12 to 15 minutes along both Calvert and St. Paul, the study said. Other facts coming from the consultants: There are 901 parking spaces along Calvert Street and 859 parking spaces along St. Paul Street. The project manager for the study, Gladys Hurwitz of DOT, undermined confidence in the accuracy of the presentation by repeatedly mispronouncing the name of a cross street, Mount Royal Avenue. She called it Mount Royale, as in Casino Royale. Every time she did it, many people in the audience snickered or rolled their eyes. Several residents asked about the implications of the slower travel times on ridership of the MTA buses and the Charm City Circulator that currently use St. Paul Street southbound. Brian Levy, president of the Mount Vernon Belvedere Association, said he believes the study should be broadened to focus on subjects in addition to travel times, such as pedestrian safety and bicycle safety. Bruce Willen, owner of the Post Typography graphic design studio in Old Goucher, wanted to know if the city would take any steps to calm traffic in case it doesn’t pursue the two way conversion. Silberman said one option for his team is to recommend that only part of the corridor be converted to two-way traffic. “Maybe not all 40 blocks could be converted,” he said. 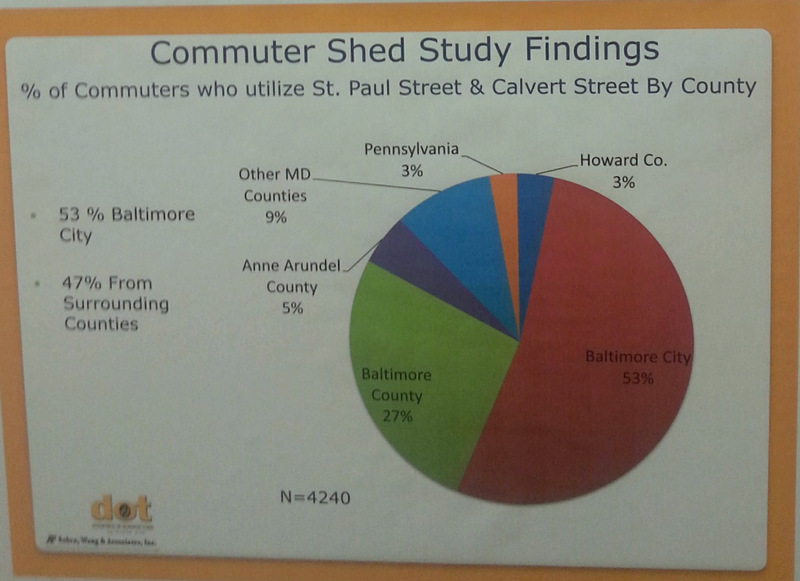 City officials said the data from the Sabra Wang study will be posted on the Baltimorecity.gov website under the Department of Transportation. • Wednesday, December 9, at the Baltimore Montessori School, 1600 Guilford Avenue, from 7-8:30 p.m.
• Tuesday, December 15, at the Benton Building, 417 E. Fayette Street, third floor conference room, from 6-8 p.m.